It is summertime! Or at least spring. Or at least there are probably some nice, sunny days wherever you are. Here in Seattle, the spring has been weird. Uncertain. Inconsistent. Last week it went from 90 degrees on one day, to 60 degrees three days later. I was running around putting all my big comforters in storage and then a few days later, was shivering under my summer blankets. But, I’m only complaining a little bit. I’m sure in a few months I’ll be longing for these temperate 60 degree days. In the meantime, nice weather means bbqing and grilling in the yard. Simple parties with your friends. Light, refreshing cocktails. A market full of beautiful fresh vegetables. So today I want to talk about easy parties. A few weeks ago I put together this spread for snacking while my man had ribs slow cooking on the grill. Because the grill was occupied, I did most of this in my grill pan on the stovetop. 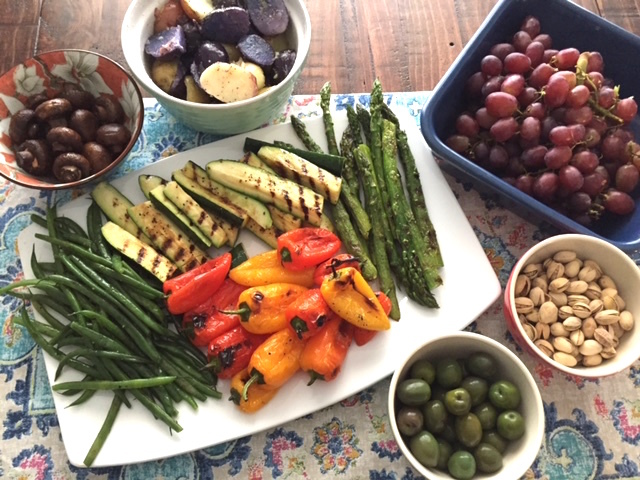 But whether you do it inside or out, a simple grilled vegetable platter is a great thing to throw together for those last minute parties. You want to be spending your time outside with your friends and a margarita, not inside working away at complicated snacks! So, here is a breakdown for a beautiful (if I do say so myself) and simple spread. For the mushrooms, also rub with olive oil, salt and pepper, and grill. When you take them off the grill, drizzle with a little balsamic vinegar and toss. I know! You don’t want to turn on the stove when it is so hot out. But, it will only take a minute. Add potatoes to a pot and cover with water. Boil until potatoes are soft. Use a spider skimmer or any slotted spoon to remove potatoes to a bowl. Toss with olive oil, salt and pepper. If you have any fresh herbs around, roughly chop and toss those in too. Then, with the water you ALREADY HAVE BOILING, toss in the green beans for 2-3 minutes, until they turn bright green. Drain and toss with olive oil and some lemon pepper. Arrange all beautiful things on a platter and set out for your guests to graze on. They won’t be disappointed. In fact, they’ll ask how you made all the vegetables taste so fabulous. The answer?